What are the key routes for improving walking and cycling in Lambeth? Lambeth want to create an attractive, convenient and safe environment for walking and cycling. 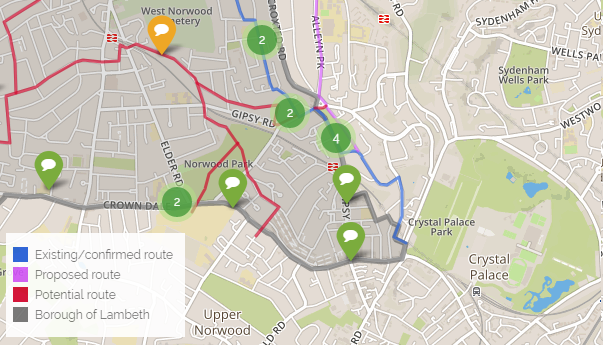 Have your say on their draft “healthy routes” on their interactive map! Where do you feel unsafe, or a crossing that needs to be improved for a route you use? For those less able, are there barriers or access issues? View https://lambethhealthyroutes.commonplace.is/ map to make comments. Registering is quick and easy for adding comments. Finally, it’s not all about infrastructure and Lambeth have a busy programme of activities to promote walking and cycling. Check out their re-launched Try Before You Bike scheme and find out about ‘Secret Lambeth’ self guided walks by contacting walking@lambeth.gov.uk for a booklet or visit their Events page for guided walks.